Free HDD LED shows hard disk drive activity in real time in the systray area and on screen. Very useful on PC, laptop or netbook which don't have it or it's not visible due to the position. 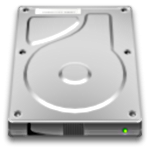 It also features a free disk space monitor (works also for pendrives, network drives and TrueCrypt drives). Free HDD LED monitors all physical hard disk drives connected to the pc (ide / sata / usb).